Whether or not cell phones cause cancer remains very controversial, but a renowned neurosurgeon has released a provocative paper reviewing over 100 scientific and medical studies, and concluded that the link between cell phone use and brain tumors on the same side of the head is now clear, and that tumors from cell phone use are now a bigger public health threat than cigarette smoking. With cigarettes, there is a very long time lag between starting the habit and developing lung cancer. It’s not surprising that it took decades to discover the link. Even though cell phones are now used by 3 billion people, they have not been very common for very long. Data in this study suggest that brain tumor rates may double after only 10 years of regular cell phone use, and continue to rise. Cell phones emit a plume of electromagnetic radiation that can penetrate our brains, a major electrical organ. Whether or not this proves to be the looming public health crisis the author predicts, I expect that any risk would be greatest for young children. The protection surrounding a child’s brain is thinner, the penetration of the radiation is deeper, the brain tissue is more conductive, their brains are changing more rapidly, and they could have a longer lifetime of exposures. Studying chemical exposures, the EPA has found that physical carcinogens average about ten times more dangerous in young children than in adults. Within five years the extent of the risk should be very clear, one way or another. 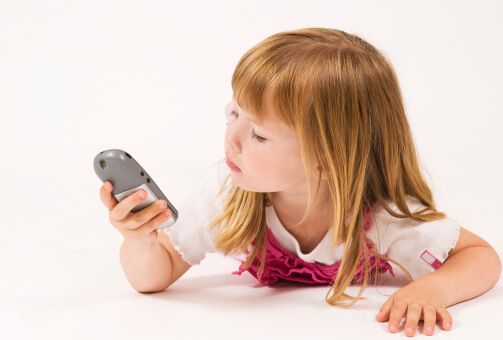 While these issues are being sorted out, it makes sense to me to minimize the time young children spend on the cell phone unless it is important. Keeping the phone at least 8 inches away from the head by using the speakerphone greatly reduces the radiation – but even an inch or two helps. Bluetooth ear pieces and regular unshielded headphones, though, aren’t recommended in this paper, because they can turn the head into an antenna for the phone signal. Shielded headsets or those with an air flow gap can greatly reduce radiation exposure to the head. We shouldn’t assume that because radiation is invisible to the naked eye it is harmless. Nor assume that because a danger hasn’t been proven in the first decade of widespread child-use that the habit is safe. Nor should we panic. New brain tumors occur in about 15 out of 100,000 people in the general population each year. Doubling that rate would only raise it to 30 out of 100,000 people. The odds against a tumor for an individual cell phone user would still be more than 3000 to 1. On the other hand, with 3 billion users, cell phones could potentially cause about 500,000 new brain tumors a year after 10 years of use – a big public health issue. And the rate after using a cell phone for 40 years? I hope we never find out. I hope that if these risks are proven, safer technologies will be developed long before then.